Before setting up your RV full-time, it’s important to be aware of your legal obligations. A few days ago I received an e-mail requesting information that made me think of some of the challenges Canadians face if we wish to become full-time RVers. A reader from Ontario had sold her house and was about to take on full-time RVing, and she asked how she could get an address for her mail and driver’s licence. I responded that depending on which province she lived in, she should check with the licensing agency as to their laws. In British Columbia we must have a physical address and not a post office box for our driver’s licence. There are numerous Canadians who would love to become full-timers but struggle with living within our laws. Their rambling RV doesn’t classify as a permanent residence and although they can have their mail sent to a post office box or use a mail forwarding service they are not legal in terms of their driver’s licence. Many end up renting or buying a small home or apartment to satisfy these requirements. This gives them a physical address and a place to store those few worldly goods they didn’t want to part with. Unfortunately this can be quite expensive and not everyone has the resources to do this. However, it does give a person an option in the event they choose to “hang up the keys” or are faced with an emergency illness. 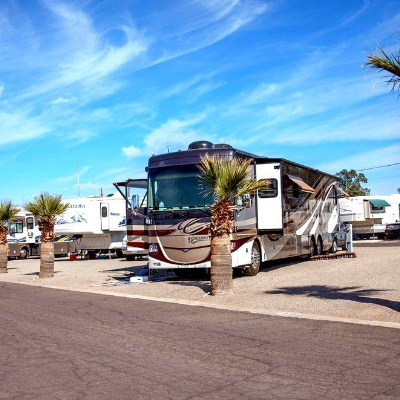 There are a few private RV resorts selling individual lots that can satisfy the law’s requirements, but it can be a challenge finding a park that is open for year-round use. On Vancouver Island there are restrictions as to how many months a person can live on their self-owned lots. This doesn’t usually apply to RV parks where a person is a tenant or guest. In the Okanagan there are lease lots and deeded lots available that can be lived on 12 months a year. 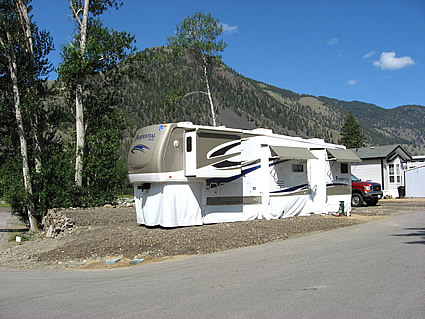 One such RV resort is Riverside RV Resort near Keremeos and another is Fort Greenwood in Greenwood, both in British Columbia. This can be perfect for snowbirds that travel south for the winter and like to have their own place to return to each summer. It also gives the RVers a place to be part of a community, which can be nice. Another option is to legally rent a room in your child’s or a friend’s home. This too serves the purpose of having a storage area and a permanent address and can be much cheaper than the other options I listed above. Mail forwarding can be another challenge, but there are private mail services that take care of your mail while you are travelling and will forward it to you upon your request. A few years ago I was travelling for a year and had my mail sent to me once a month—to either the RV park I was going to be staying at, or directed to General Delivery at the local post office. This worked very well. All I had to do was phone my mail service, provide a Visa number and give them the destination address. I have never encountered any problems. Others I know have their children take care of their mail and forward important letters to them as needed. With today’s computerized world, most bills or communication can be done via the Internet, reducing the need for a heavy amount of mail to forward. There are always challenges, but if what we want to do or have is important enough, we will always find a way to make it work. So if you are contemplating becoming a full-time RVer and are faced with the challenge of living within your local laws—don’t give up. It can be done. Yes, the weather has changed and it feels like snow might be arriving at any time, but that doesn’t mean RVers have to quit living in their RV or head south to a warmer climate. The RV lifestyle can be enjoyed by retirees, semi-retirees and those who are still working.